A properly serviced A/C system reduces the load on your car’s engine and keeps you more comfortable on the hottest days. Chances are, the last thing you need is someone explaining why you need your car’s air conditioning to work right. You know what your A/C is for: All you need to do is slide behind the wheel after your car’s been parked in the sun on a hot day. But there are a lot more reasons to have your car’s A/C system serviced than simply keeping it cool inside. That’s because, to work properly, your A/C system depends on a lot of other systems to be in good condition. For example, a working A/C system adds a lot of heat under the hood. That additional heat could easily cause problems if your cooling system isn’t working properly. Another thing the A/C adds is load. 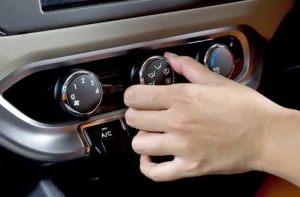 The A/C compressor operates from engine rotation through a fan belt; often the same belt that drives your car’s water pump, alternator, and power steering. If that belt’s a little worn or loose, it might still drive the other devices. But the A/C adds a lot of load to the system, and that additional load could be the straw that breaks the camel’s back. And, if that belt breaks, it could do more than shut your A/C off: It could leave you stranded. All that and more is why it’s so important to have your car’s A/C system checked each year… not just to keep you comfortable on those hot summer days, but to make sure the rest of your car can handle the additional load. Your local Cottman center’s technicians are very familiar with today’s air conditioning systems. The have the skills to make sure it’s working properly… and to get it back into like-new condition if it isn’t. But more important, they know how to examine the related systems, to make sure your car won’t leave you high and dry on the hottest summer days. So, before you head off on a summer road trip — or even for local driving on those days when the mercury is climbing — get your car in to your local Cottman center for a complete A/C system service. You and your car will be glad you did!